Russian diamond giant Alrosa announced Tuesday it has extracted a unique gem from its Yubileinaya mine, weighing 145.44 carats and worth about $1 million. 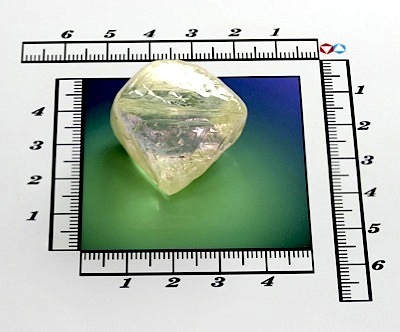 The octahedron-shaped diamond is transparent with a yellow tinge and its measures are 35 mm by 20 mm by 26 mm, said the company. Last year, the state diamond monopoly produced a rocked weighing 888.15 carats, the fourth largest extracted in Russia, from the same mine. Alrosa is Russia's largest diamond miner, accounting for about 25% of world production and 97% of all diamonds mined in Russia.